Generally the discussion related to mens rings with green gems does not stray beyond green jade and green emerald. In reality there are a range of green gemstones available in nature. Just as these green gems differ in their green color shades, they also have different price points and durability (hardness) ratings. In this report we will discuss the popular green gems that you could choose for a mens gold or 925 silver ring with green gemstone. We will keep the emphasis on education and information rather than on selling. This will make the report more interesting and useful to a wide range of gem and jewelry lovers. If you have a specific green gem in mind for your mens ring, it might be a good idea to get more information related to that gem. On the other hand, if you wish to get a mens ring with a green gem but, are not particular about any specific gem - get to know as many green gems as you can before you make a decision. This report would be very useful to you no matter, which of the above categories your requirement covers. And if you have read this report but yet not, acquired the information that you need - email our support team at sales@kaisilver.com They will be glad to help you even if you do not purchase anything from us. Let us now move on to discuss about the most popular green gems that can be seen in jewelry. Emerald: Surely one of the most valuable green gemstones of all time, emerald is the birthstone for May. So if you wish to have a mens birthstone ring with a May birthstone, emerald would fulfill your requirements. To begin with, emerald is an expensive gem and is generally in the same price range as rubies and sapphires. A member of the beryl mineral group, this gemstone is formed over millions of years and the stress and strain of the difficult conditions in which it is formed, shows on the gem. The MAN71 Men's Emerald Band shown here can be ordered with a combination of gemstones. Crafted in gold or 925 silver, this men's emerald band provides good protection for the gemstones. A mens gold or 925 silver ring with this green gem, would always show visible inclusions and fissures in the gem. If you choose this green gem for your ring be ready to, give it some care and attention. The natural fissures that are always present in natural emeralds, make it a bit weak. You will therefore need to ensure that, the gem does not get physically struck by a hard object or surface. Almost all emeralds including those priceless pieces preserved in strongly guarded museums, are treated with natural oils to improve their color, clarity and lustre. With this treatment comes a small requirement - avoid exposing your mens emerald ring to sources of heat or strong chemicals and solvents. You really should ensure that the oils in the emerald are not damaged or forced out of the gem. Peridot: This is a green to yellowish-green gem from the olivine mineral family. This gemstone which happens to be the birthstone for the month of August, is very popular with men and ladies. Known for many thousand years, peridot was a gemstone that was often mistaken for emerald - you might have heard of how some of Cleopatra's valuable 'emeralds' turned out to be peridot when they were tested. 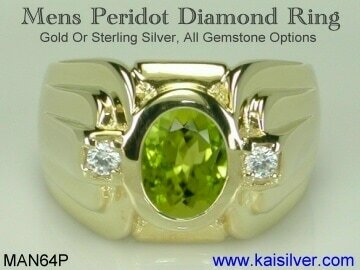 When it comes to mens rings with green gems, peridot is an interesting case study from the view point of price. The MAN64P Men's Peridot Ring can be ordered in yellow, white or pink gold, you also have the option for 925 sterling silver. No matter which metal you choose, rest assured that the same quality standards for gemstone and workmanship will be provided for all metals. The earliest peridot gems were mined in Egypt and a long time later, the world was introduced to some amazing peridot gemstones from Burma. With almost no fresh mine output of peridot gems coming from Egypt and supply of good quality from Burma coming down to a trickle - the industry had to find new sources for this very popular green gemstone. Most of the peridot gems that enter the gems and jewelry markets these days come from China and Arizona (U.S). Like in many other cases, the industry places high importance on peridot that originates from specific mining locations. This translates to high price tags for peridot coming from Egypt or Burma. To give you an idea of just how high the premium on peridot gems from these locations is, here is an example. A 10x8mm oval good quality peridot gem from Arizona or China with a yellowish-green color could cost around 100 U.S$ (per piece) in the retail market. The same peridot gem size coming from Egypt or Burma with very little or no yellow hints, could cost as much as 250 U.S$ to 350 U.S$ for the piece. Unless you have a lavish financial layout for your mens green gemstone ring, we would suggest that you do not worry much about the origin of the peridot gem. Give attention to overall clarity and uniformity of color - a slight yellowish tone to the green actually seems to add some extra spice to the gemstone. Tourmaline: This is one gemstone that is found in a dazzling range of colors. A truly spectacular phenomenon can be observed when a single crystal of tourmaline shows more than one color. 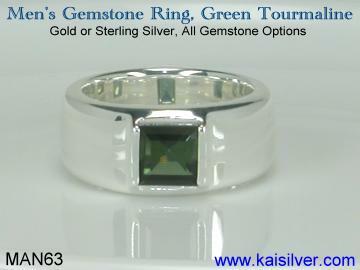 Green tourmaline offers an excellent option for a green gemstone to be set in a mens ring. The deep olive to forest green color of tourmaline, is something that most men like. Although many jewelers club tourmaline (of all colors) in the category of October birthstones fact is that, it was only pink tourmaline that was added as an option for the October birthstone in 1996. The MAN63 Tourmaline Men's Ring maintains the same quality standards in gold or silver. Tourmaline is a tough gem and will not call for too much attention when being worn or stored. Having said that we would still suggest that your mens tourmaline ring be kept away from environments where it could be hit or be hit by, hard surfaces and objects. The price of your mens green gemstone ring with green tourmaline, can be quite significant. While the gemstone is priced much lower than ruby, sapphire or emerald - the steady price increase of tourmaline has reduced the affordability of this green gem. For a mens ring with green tourmaline we would suggest that, you keep your expectations on gem size in control. A green tourmaline in the 2 to 3.5 carat range is where the limit for a 'modestly' priced gem would border. Just remember that the color of green tourmaline would be fairly dark, the deep color might also appear even darker if the gem is large with a proportionately significant depth (thickness). Jade: While green jade remains very popular, this gemstone is actually found in other colors like yellow, black, white, lavendar and read too. Choosing this green gemstone for a mens ring, is surely going to provide you with a tough and durable gem. Though the hardness rating on the Mohs scale for jade is not very high, it is the insternal structure of jade that makes it strong and durable. When man first came to learn of the strength of this gemstone, he used the stone to make weapons, tools and arrow heads. The jewelry applications of jade came in much later. Most of you might have seen jade with a fine green color evenly spread on the gemstone - going by appearance this is fine quality jade. The MAN125 Jade Ring is available in gold and sterling silver in all sizes. But not many people are aware that more than 90% of such fine quality jade gems are treated to enhance their color. The point is that natural jade when found with a fine green color that is uniformly spread on the stone, is very expensive. The widely used and accepted treatment of dyeing natural jade, makes the stone with a fine color available at an affordable price. 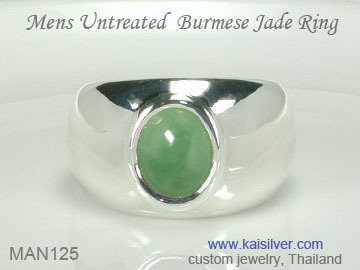 So if you need a mens green jade gemstone ring but, would not like to spend an extravagant figure on the jewel - consider dyed natural jade as an option. There is no doubt that many wear gemstones for the tradition and metaphysical properties attributed to them. When this is the case, it is quite common for the buyer to expect an untreated jade gem. And if you want to get a natural untreated jade gemstone at a moderate price - you can go for natural jade stone that does not have the perfect color and shows some interesting portions of color zoning. Just appreciate the fact that nature created the gem that way. One important thing that you should keep in mind is that jade, covers two gems - jadeite and nephrite. The darker green shades of nephrite which can sometimes shows blackish streaks is preferred by many men. Here is another big tourmaline gemstone ring for men, the unusually large green tourmaline gem in this ring measures is a hefty 11x9mm stone. Since the durability is significantly influenced by metal weight, we have assigned 25-30 grams of silver or gold for this ring. This is a dream men's green gemstone ring that is designed and configured to last a lifetime. The MAN136 Men's Green Tourmaline Ring can be customized to suit your preferences. You could request for a change in gem shape and size, or have a completely different design crafted just for you. The deeper green hue of this gem is what most men long for, the ring will go well with both casual and formal wear. If you plan to wear this men's green stone ring for a formal event, don't look to match colors for your complete outfit. Green is one color that pairs with every other color in the spectrum. The darker tones of green like those seen in tourmaline do not really clash with any color palette. This ring is all about the gemstone, tourmaline is strong enough to take care of itself, just make sure that you don't bang the ring around. Each tourmaline men's ring is custom made, you can select gold or 925 silver as the metal and specify you ring size. The men's gold green gem ring can be ordered in 14k or 18k gold, you can also select white, yellow or rose gold for your ring. 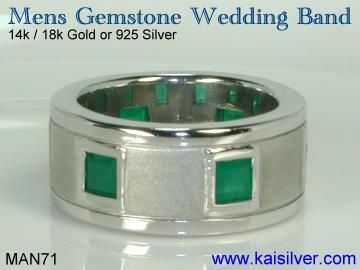 The Kaisilver Men's Green Gemstone Collection, is a great place to begin your search for a quality men's ring. While the rings shown on the report look truly awesome and will impress most of you, we can also custom make a ring or any other jewel based on your design ideas. ​Kaisilver: We have pioneered the establishment of high end online custom made jewelry. More than 7,000 quality conscious and knowledgeable gem and jewelry lovers across the globe rely on Kaisilver for all their gem and jewelry requirements. We maintain the same quality standards for silver and gold jewelry and can custom make all types of jewelry with your designs or ours. Our direct connections with almost every gem mining center across the globe, give us direct access to the world's largest gem resources. We are also privileged by getting preferential access to more than 200 million carats of cut and polished gems. Since we are not restrained by any fixed inventory or commitments, we place no restriction on your gem selection. Some of the best talents in the jewelry design and crafting community work on all our custom jewelry orders. Do take the benefit of our expertise in this industry and contact us with any queries or requirements that you might have, the team at sales@kaisilver.com will be glad to help you. Since you will never be under an obligation to purchase anything from us, we encourage you to keep in touch.